CarBuyerUSA.com is the nation's premier consumer-directcar buying company. We are not a junk car-buying website—we are an elite team of automotive professionals with decades of experience in auto auctions, automotive retailing, repair, and used vehicle valuations. Our seasoned professionals know value when they see it, and we’ll make sure you get the money you deserve for your used car. Selling your car privately can be a long, drawn out process that sees you losing money every day your car goes unsold. If you need to sell your car quickly, then you want a source you can trust. You’ve come to the right place; our car buying processes are designed to help you sell your car in the quickest amount of time possible. With CarBuyerUSA your used car sale will be fast, safe and easy. While we don’t pay Kelley Blue Book for used cars (nobody does), we will pay you market value and treat you like the customer, not a door mat. Avoid fraudulent payments and car scammers. Don’t negotiate with salespeople at the dealership, and stop pouring through the newspaper classifieds. Simply fill out our online form and receive quick quotes for your used car. Start selling your car today with our reliable car buying company. CarBuyerUSA has an A rating from the Better Business Bureau. We’re licensed, bonded, and insured, and we are a proud member of the National Independent Auto Dealers Association. Looking for a trusted company who buys used cars for cash? 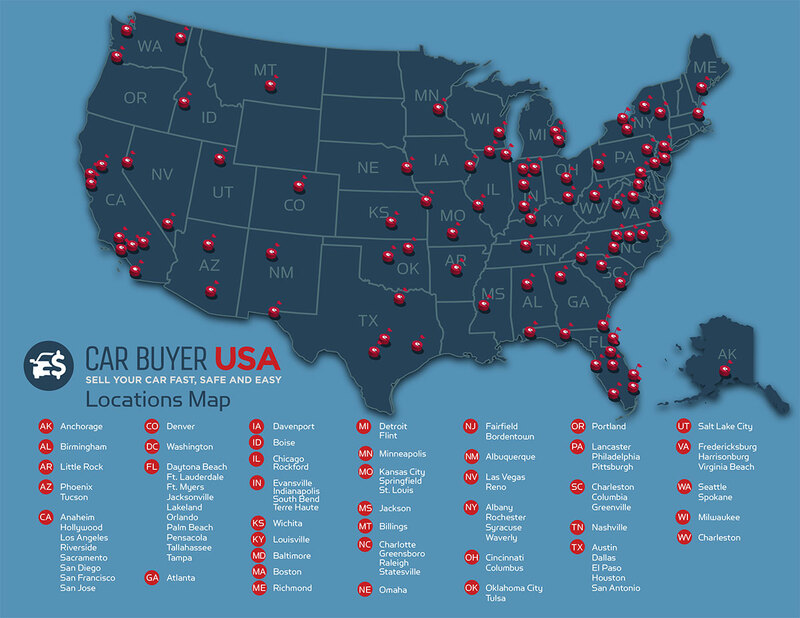 CarBuyerUSA can help you sell your car quickly for top dollar prices. California State law requires any car seller to provide a buyer with a valid smog inspection certification at the time of transfer or sale. If you haven’t had your car smogged within the last 90 days, you’ll be forced to jump through hoops to get the smog certificate. CarBuyerUSA makes is easy, as we handle all of your DMV paperwork and smog certification. We buy cars from consumers nationwide from our Atlanta headquarters and we have preferred facilities in all major cities across the United States. Vehicles dropped off receive same day payment or we can come to you (home/business) and payment is made before we take possession of your vehicle. We are bonded, licensed and insured as a motor vehicle dealer but instead of making you deal with the hassle of coming to a dealership, we make the process of selling your car convenient and safe. We buy any car, in any condition, anywhere in the Continental USA. No other car buying company—not even CarMax—pays more for pre-owned vehicles. Plus, CarBuyerUSA will buy anything from a rollover to a Range Rover. We buy vehicles from $65.00 to $65,000 every day, even on Sundays. Almost 1/3 of all the vehicles we buy have some type of mechanical issue, and many of them don’t even drive. There are many companies that buy cars, but we are committed to earning your trust and paying you more for your pre-owned vehicles than any other car buying company. As car buyers, we are committed to making every car selling experience the best possible. We help our customers sell their unwanted cars quickly and efficiently. Whether you’re selling a car, SUV, truck, motorcycle, boat, or RV, we’ll offer you a fair price and expedite the selling process. Simply fill out a short inquiry online detailing the year, make, model, body, and current mileage of your used car, and press “Get My Offer Now”. You’ll receive a competitive offer with no obligation to accept. You don’t need to buy anything from us to receive a free quote, and you can decide whether or not you’d like to sell your car to us. After answering a few questions, you’ll receive an immediate cash offer over the phone. Provide your VIN, Trim-Style, and mileage and upload pictures of your vehicle and send them directly via email to pix@carbuyerusa.com. Once you’ve received an offer from our helpful car buying agent, you can accept and receive your payment within days. Why Should I Use a Car Buying Company?. If you’ve every tried selling a car privately, you likely already understand the hassles and delays that accompany this frustrating process. If you need money fast, a car buyer is your best bet. After appraisal and acceptance of the terms, we can have the agreed upon cash in your hand within just a few days. Perhaps your car isn’t useful to you anymore and you’re looking for a convenient way to get it off your hands. Let us take that stress off your shoulders and pay you a great price. Maybe you need to part with your car quickly thanks to an upcoming move; while the process of selling your car privately can take weeks or even months, CarBuyerUSA can buy your vehicle and have money in your pocket within just a few days’ time. We help you handle the paperwork and even provide car towing free. We offer convenience you won’t find at a car dealership. Instead of waiting around, we come to you and make it quick and painless to sell off a car you no longer use. We will never send you to a dealer or a third party source, unless you have a junk car that is simply too old; in these cases, we will recommend you call a toll free number. Your personal information is not shared with any third party without your permission. We know our customers are busy, and that’s why we make every effort to send professional representatives straight to your door to buy your car. Our car buying appraisers can come directly to you that provide the best in on-site service. We can come to you today with fast cash in hand. After accepting our offered price, simply sign a Digital Purchase Agreement, and have an inspection scheduled. Vehicles dropped off are generally left overnight for inspection completion. This process could take up to 48 hours depending upon your geography and facility demands. For those needing a more convenient solution, our mobile inspectors can come to your home or place of business and will contact you directly to arrange an inspection. Choose the way you’d like to receive your payment: bank check, bank wire, or certified funds. Once you’ve received your funds, the signed title is then turned over to CarBuyerUSA; walk away with cash in your pocket and relieve the stress of selling your car in one fell swoop. Don’t worry about the condition of your car. We buy all makes and models, including Ford, Toyota, Lexus, Honda, and more. Even if your car has been damaged or wrecked, we can purchase it—even if it doesn’t run. Was your car towed, leaving you stranded with no way to get it out? You can still sell it to our team of trusted car buyers. We can have your vehicle released and towed to one of our storage facilities, where we will then be able to purchase it from you. From Subaru to Mazda, Porsche to Ram, we’ve made cash offers on all types of vehicles. Whether you’re selling a recreational vehicle or a pickup truck, we’ll make you an offer in cash that’s often better than our competitors. From used cars that have long past their heyday to new luxury vehicles that have less than 5,000 miles, we can pay top dollar for your used vehicle, giving you more than any other car buyer on the net. CarBuyerUSA specializes in vehicles that have undergone previous repairs, have experienced frame damage, or those that are struggling with mechanical issues. We provide an inspection on site or in one of our many facilities. Even if your vehicle fails our inspection, we can still buy your car. Can’t find the title to your car? We can still buy it. We’ll help you get a replacement title and buy your car from you the very same day. With title processing agents in states across the country, we are experienced in expediting duplicate title applications. We employ a team of professionals skilled in extracting value from used cars. No matter the condition of your car, let our car buyers determine the best price for you and get the money you deserve for your sale. How Much Will You Pay Me for My Car?. CarBuyerUSA agents will provide you with multiple cash offers that will help you make more money on the sale of your used car. We pride ourselves on our efficient, courteous service. Get top dollar for your used car and let our skilled car buyers come straight to your home. With years of experience and plenty of happy customers, we’re committed to making your car selling experience easier and more convenient than ever. Selling your car online is easy if you choose CarBuyerUSA. We buy cars in any condition from consumers nationwide. If you need cash for your car immediately, receive an onscreen quote in seconds and sell your car with ease today.